It's a tradition. We do the CIM Relay every year. 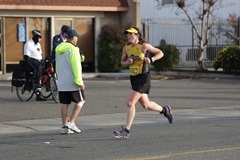 Robin does it with her UC Davis buddies and I do it as a FCA (Fellowship of Christian Athletes) Endurance team. This year I'm a 2-person team with Karen Nickel. I'm doing the 2nd 1/2. 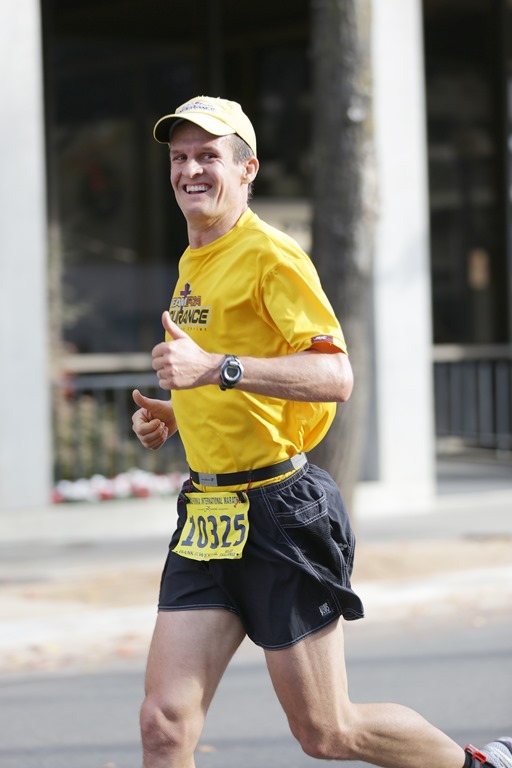 My goal is 7:00 pace for a 1:31 1/2 marathon. But that's 30 secs a mile faster than my last marathon pace. I'm hoping my achilles and hamstrings issues will hang in there. But mostly I want to run with my focus on the Lord. I know in that case, it will turn out just as He wants it. The weather is great. Ariel and Anna are with me scooting around while I wait for Karen to arrive at the exchange. She's probably going to run a 1:37, her previous best. Robin is also doing the first 1/2 of the marathon on her UC Davis Team so I'm expecting to see her and Karen come in together. I see Dave Campbell go by on the EliptiGO bikes leading the pros. I also see the rest of Robin's team, Leonie and Megan here. I get a good warm up in. Achilles and hamstring feel good. Here comes Karen! Ahead of pace. Hand off goes great but she tells me Robin's hamstrings have flared up and to pray for her. As I take off I immediately pray for her. I know how uncomfortable that can be for her and it's a bummer because she's been working on them so much lately. Mile 1: 6:47. I figured the first mile would be under my 7:00 goal, so won't assess until a couple more are behind me. I'm trying to run tall, efficient and relaxed. Mile 3: 6:56, 6:45. After a few miles, I'm surprised to be maintaining a sub-7 pace. I see friends along the route like Reed, Sean, and others. I hope they realized I'm only running the 2nd 1/2. While surrounded by many runners, I look to my side and see Bob Erhardt from work! We're both amazed to be running side-to-side in this crowd. He's doing the whole marathon and going for 3:19. Mile 5: 6:52, 6:51. Bob settled back as I pushed forward. Still so happy, and thankful to God, to be averaging sub-7 pace! Another marathoner (Jacob) matches my pace and says it's really helping him to stay with me. I encourage him and even pray for him. 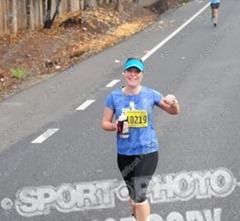 Mile 7: 6:47, 6:53. At the famous 20 mile mark. The "Wall". But fortunately for me it's only mile 7. I'm amazed Jacob (the guy I met) is still with me. He's negative splitting his marathon which is really hard to do. 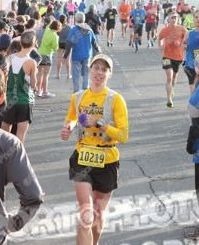 Mile 12: 6:40, 6:39. This is going great! After the bridge I picked it up. Jacob held on for a mile before dropping back. With 1 mile to go, I'm really sore but try to pick it up even more. That's when I feel the hamstring start to go and quickly slow it down a little. I hear Dylan Cook and Nicole cheering for me. It really makes my day. Now I just have to run as smart as possible to keep up the pace without blowing a hamstring. I come around the corner and thank the Lord as I finish. 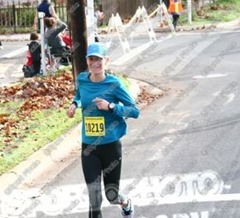 Mile 12.9: 6:37 pace. Actually was able to negative split! Thank you, Lord. Our team finished 3rd in 3:06:44. Thanks, Karen! Note: The CIM Relay Races started in 1991. I meet 6 friends (2 pacing and 4 racing) at Maidu Market at 5:30am to drive them to the start. We load up and head down to Beal’s Point which is less than a mile from the start. It’s a fun ride down. I drop off the group at the camp bathrooms and park the car. After the pit stop, we run to the start for a warm-up. The weather really couldn’t be better! 2 years ago was torrential rain/wind and last year was extremely cold. Once at the starting area, we all begin to go our separate ways but not without encouraging each other first. Karen Nickel and I run to the start and get some strides in. My hamstrings are tight and I feel like I cannot go as fast. I’m hoping once the race starts, I’ll loosen up. I’ve been trying some new things to help the hamstrings like myofascial exercises with a lacrosse ball and trying to get some consistent massages…though this week I skipped it as I got too busy. But, the hamstrings have been much better lately so I’m hoping it will go smoothly. I give Troy and the girls a call to pray with them. It is a critical part of any race! I find Karen and we look around for some of our other friends racing up near the front: Bailey Shykowski (17 yr old, 1st marathon), Melissa Penwell (first marathon) and Troy Outman (marathon veteran). We cannot find them so we find a spot on the starting line. I run into my friend Beth Bourne. I pray with her and Karen. Mile 1 is 7:07. Good start! There are so many runners ahead of me, I’m amazed! Mile 2 is 7:03.. Feeling good! My hamstrings seem to be okay. My right shoe seems to be too tight and it’s hurting the top of my foot. Should I stop? No, I decide to press on. Mile 3 is 7:05. Wow, this is great! I can even see the 3:05 group coming back to me! I might really be able to run close to 1:30. The top of my right foot is still bothering me. I hit the first aid station and see Rob Myer and Jesse “Santa” Ellis handing out water. I say hi and grab some water. Mile 4 is 7:12. Both hamstrings (the whole hamstring on each) are starting to feel tight! Okay, just hang in there! The 3:05 group is fading away. Mile 5 is 7:10. I’m able somewhat hold the pace but these hamstrings are getting worse. The course rolls quite a bit (forgot about that) and that seems to be aggravating the hams. The top of my right foot is no longer an issue…I’d take that though over the hams!! Mile 6 is 7:20. More pain/discomfort! Ugh! The 3:10 pace group goes by. I know this means Michael Cook’s 3:15 group is coming soon along with Karen, Troy O and others. It’s hard not to be frustrated. My engine is ready to go but these legs are not. Lord, please help me to keep a good attitude. Mile 7 is 7:16. I’m hanging in there! Man I’m just barely over halfway. Lord, please help me get through this! Mile 8 is 7:31. My hamstrings seem to be going through periods of “cramping”. It won’t hurt for a moment and then it really hurts. At those worst moments, it feels like my legs want to give out on me! It has never been this bad before! Mile 9 is 7:34. Lord, help! I’m just trying to go as fast as I can. When the cramping stops briefly, I try to push it…but these moments are so short. Mile 10 is 7:47. Getting harder! I contemplate slowing down but I know I cannot give up. Today is all about persevering! We are going downhill through a small twisting part of Fair Oaks. It’s a cute area with a lot of energetic folks cheering. I try to smile through the pain but it’s hard. Beth comes by and encourages me. She could tell that something was going on. I tell her to keep going for it. Mile 11 is 7:54. Ugh! Karen comes alongside and prays for me. I really appreciate her slowing down to do that…she is such a great friend! I tell her to go for it and that I’ll see her at the relay finish. I’m doubting that the Lord will turn things around…but at that moment, I feel some relief! Soon Troy Outman is alongside me and praying also. He’s going for a 3:15 today and seems to be running great! I appreciate his prayers and want to pray out loud for him too but let the pain consume me. I say a prayer for him in my mind. I start to feel even better! Thank you Lord! How can I doubt you?! I tell Troy I’m going to try to catch up to Karen. He tells me I need to go now. Mile 12 is 7:25. Wow, prayer does work! Though the hamstrings still hurt, I no longer feel like my legs are going to give out! I can move them a little better too! Thank you Jesus! Michael Cook’s 3:15 group catches up. I tell him about the hamstrings and he encourages me to get some electrolytes. I thank him and try to get some aid at the next station. I'm unable to get through the many runners and miss my opportunity. At least I’m almost done! Mile 13 is 7:21. Better! Thanks Jesus! 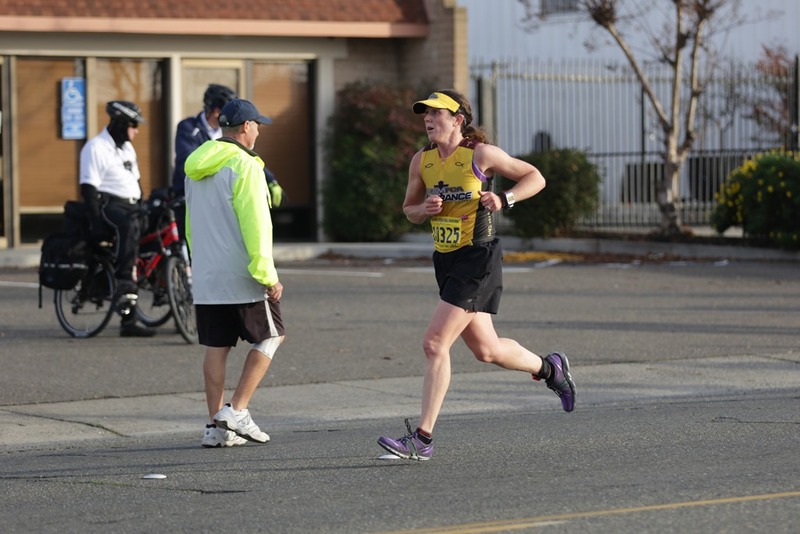 I make it through the half marathon. I can see now that the relay finish is after the 1/2 Marathon…and it’s still down the road! I’m giving it my all to catch Karen but she is strong. I see her head into the exchange area and hand off to Troy. I hope she tells him. I wish I can talk to him but I’ll see him at the finish. I finally get there and see Leonie ready to go. She grabs the chip and I tell her she can do it! She takes off and I find Megan Sebra my other teammate. Time for her to head to the last exchange. I then find Karen and the girls. I’m in major pain but am so glad it’s over! Thank you Jesus! !